Click here for Chinese Local News Video about Students' Shanghai World Expo Experience sponsored by Mr. Zhou and Ms Shi through our partner Zhong Mei Ai Xin. Please also read here for profile of six high school students admitted to colleges. 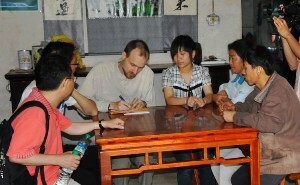 Alec Johnson, a graduate student at UW-Madison, sponsored 6 needy students in Ningguo County, Anhui Province, China. 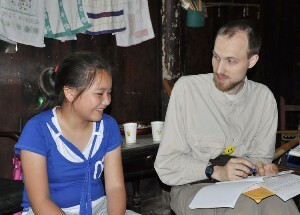 He attended a professional conference in Beijing during June 14-19, and visited Ningguo to see his sponsored students on June 25 and June 26 for two whole days. He arrived in the evening with his friend Bo Xie from Shanghai by bus (4 hours), and left for Hefei on Sunday morning. If you read Chinese, and would like a more interesting reading about this visit, please go to Mr. Hu Jining's writing at Zhong Mei Ai Xin. 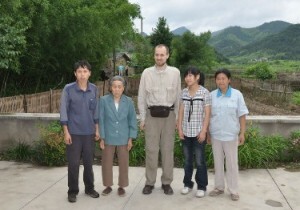 At 8am, Friday morning (June 25), we went first to Xia Xi Middle School to see Peihua Wang, a student sponsored by Alec. We first met her at school and had a brief meeting there with school administrators. Then we went to her home to meet with her family. Peihua Wang is a 8th grade girl born in March 1996. She lives with her aged grandma, her mother, her step father, and her older sister. Her step father happens to be her father’s younger brother. Her own father died when she was very young. Her uncle (now her step father) helped the family and eventually married her mother. Her step father treated her and her older sister well. Her sister is in a three year college, which needs a lot of money. Both her parents are farmers and have little income. She is a shy girl, at least, that is the first impression both Alec and I had. She gradually opened up and talked with Alec as it moved on. Somehow amazingly, she was quite brave and did a very nice interview with a local TV reporter in the end. Jia Zhou is a 8th grader in Ning Yang School, a brand new modern school housing first to ninth graders. He is 16 and is very shy. He lives with his mother and his step father in rented two separated small rooms in a house. They have no furniture, they share a bathroom and kitchen with other families. His mother recently found a job at a local restaurant washing dishes, and his step father is a bricklayer who typically earns a little over 10000 yuans. They are very poor now. But I think that his situation will get much better in a few years. His mother and step father seem to be hard working and caring persons. Although he was quiet, he was thoughtful. He gave Alec Johnson a small smiley face button with his name and school name written on the back (by himself). Alec was very happy with the special gift. Jia Zhou likes Ping Pong and Physics. He is quite smart according to his teacher although his grade is only about average due to poor academic background. While at Ning Yang School, we also met three other girls we support. They are all 8th graders by chance. They are Siyi Mao (likes English, dreams to study abroad and travel to US in future), YuChun Wang, and Yuanting Li (likes Chinese). Middle school students have their regular days at 7:15-11:30 and 2-5pm. They have a lot of homework and a lot of serious exams. The pressure is very high for them to study hard to get into a top high school through very competitive entrance exam at the end of 9th grade. 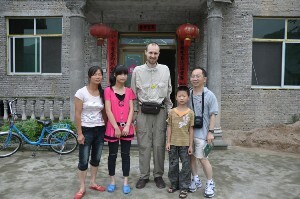 In the afternoon, we first visited Yao Bao’s family. She is a lovely and outgoing girl in 11th grade at San Jin High School. She was born in 1993 and lives with her father and mother. His father used to be a bricklayer and looks smart. 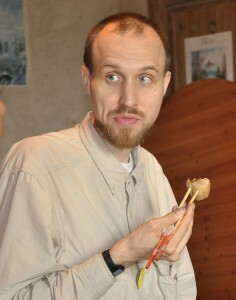 But a car accident in 2007 broke one of his legs, and even worse another accident in 2009 broke one of his arms. He cannot work anymore and the family has a lot of debt. Her teacher helped her mom get a temp cleaning job at her high school. She is very good in school and likes biology. She hopes to get into college next year. HuiXia Zhu is a 8th grader in Ninn Guo Middle School. Her mother died years ago. Her father remarried and had another boy of 8 years old and started a new family. She lives with his grandparents on a rented room in the city. His grandpa cleans a local farmer’s market (earns 700 yuans a month) to support the family. Her father’s sister and handicapped brother often chipped in a little (for clothes and food). She works very hard and gets up at 5 and walks to school. She is very independent and a top student in school (7th in her class of about 60). Her grandma, her father’s sister, and her main teacher all have only good words for her. She is a little shy and quiet during our visit. The last stop of the day in Jin He High school, the 2nd best high school in Ningguo. Here we met four sponsored students Mr. Zhengyu Liu (11th grader), Mr. Rongwei Hu (11th grade), Miss Yuting Yang (10th grade), and Mr. Yuefeng Liu (7th grade). We met them at the meeting room with their main teachers, and school administrators. It is quite formal and they do not say much, understandably. Alec Johnson told them to keep their mind open and keep the curiosity all the time. We just don’t have time to visit their family individually although we will visit Zhengyu Zhou’s family on Saturday morning, which is about 2 hour drive from the school. The school administrators showed Alec Johnson and Bo Xie around their school while I excused myself to talk with the four students privately. We had interesting chat. For example, Rongwei (sponsored by Zhaohui Wu & Yuhong Yang) told me that his grade is not great. But he hopes to do fish farming if he does not get admitted to college. 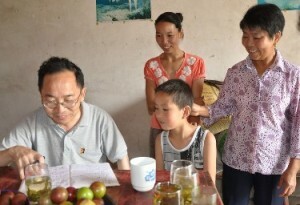 He observed that one of his relatives is doing fish (maybe other animals) farming and is doing pretty well supporting the family. I found that very encouraging and refreshing---the kid is thinking ahead. Zhengyu wants to be a policeman since it represents the fairness. Both of them feel that the reality is very competitive and the competition is fierce (they both will graduate next year). Yuting has just come to the city for his freshman year in high school and is excellent in school. She is very good at Chinese and English and quietly asks me for advice to improve her math. A few years ago, she sent a beautiful picture she drew to Drs. Adem, her sponsors. I was very surprised to hear that she got no training at drawing at all and she does not draw anymore because of pressure on school work. Her goal is to go to a top university. Finally, Yuefeng, who is only a 7th grader, has a lot of dreams and the dreams are changing. That makes perfect sense as a 7th grader. Sometimes, he wants to be a head teacher of a class, and sometimes he wants to be a CEO of a company. He wants to make a big difference. He told me that his father could not move, not to mention working. He has also been sponsored by Drs. Adem since 2004. The same is true for Yuting Yang. They all appreciate our support very much. 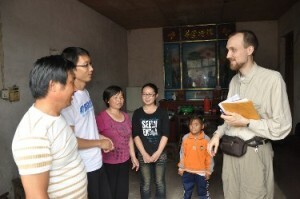 On Saturday June 26, we started earlier at 7:30am to drive almost two hours (part of the road is quite rough) to the town of Xian Xia and the nearby villages to visit students sponsored by Alec Johnson and others in US. 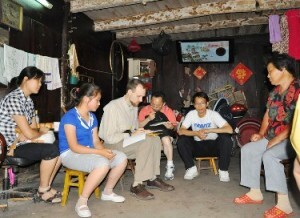 The first stop is Zhengyu Zhou’s home. The town is quite old and interesting. His house was build more than 200 years ago in Qing Dynasty. The house has 4 parts with the middle an open space. His family and three other families share the open space while each family has one corner as their own. His father told me that the neighbors get along really well. His father is a farmer trying hard to support family. The family include his grandparents in their 70s, his father, and himself. His grandma is almost blind, and his grandpa has serious back problem. His mother divorced and left quite a few years ago. This is a very nice family, and his father can simply not support the whole family. They appreciate Alec’s support and visit very much. The second stop is the Xian Xia Elementary School, which has 104 years of history, and is perhaps the oldest schools in Ningguo County. 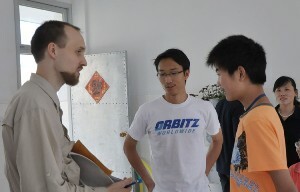 After talking with the principle briefly, we visited Xian Xia middle school briefly. 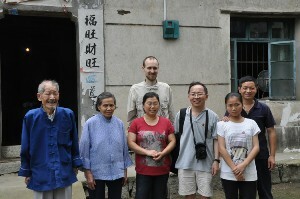 We went to visit Yu Zhang’s family. Yu Zhang was born in March, 2001 and is a 3rd grader boy. He lives with his aging grandparents (we did not see that day), his parents, and his older sister who is in 8th grade. His father is carpenter and is currently working at Wu Hu city about 4 four hour drive from his home, and is rarely home. His father is the main bread maker of the family. His grandpa has high blood pressure. Yu Zhang is very good at hand making, and gave both Alec and me a small gift made of paper by himself. He is very good at school and at home. Alec is concerned about long term effect on little Yu Zhang of his not seeing his father at home for a long time. The third stop is Miss Ming Yang’s house. Ming Yang is a 8th grade girl born in October 1994. She has been sponsored by Yi Wang and Zhiren Wang. She lives with his grandparents, his parents and his younger brother. She is herself handicapped and walks inconveniently. She likes English and politics. She works hard although her grade is about the average. Because of her handicap, she went to school late and stayed in 6th grade for two years (her father did not want her to walk too far to middle school due to the handicap). Her father was injured in 2008 due to an accident. He had a surgery and chemotherapy quite a few years ago which cured the some cancer but caused serious problems in both eyes. Her father can not do heavy work anymore. The family has little income. After lunch, we went to Zhaoxin Li’s home. He is a 4th grade boy born in November 1999. He is a very cute boy. He lives with his parents and his older sister in 5th grade. His grandparents live next door to them. His grandpa fell from the house a couple of years ago which causes serious brain damage. Both his parents are farmers. He likes math and singing. His teacher told us that he often gets 100 percent in math exam (elementary school exams are much easier than middle school exams and not meant to be competitive). His sister likes math and drawing. He seems to be a favorite student of his main teacher, who has nothing but high praise of the little boy. The teacher also emphasizes that he is a very honest student. Once he found a 100 yuan bill on his way to school with nobody else in sight and turned it in to his teacher. That says something about his character. He helps some chores at home. His sister is cute too. Incidentally he has been sponsored by my son Peter Yang, using his spare money and the money he earned in Table Tennis competitions. 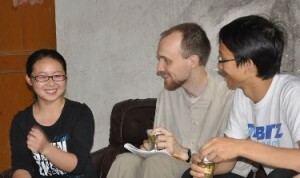 I wish that I knew beforehand and had brought Peter with me during this visit (Peter was in Ningguo). We hope to have Peter visit him next summer. The last stop is Lin Zhu’s home. She is 7th grade girl born in July 1997. She has been sponsored by Mrs Wilson. She lives with her grandparents in their 60s. Her father died when she was very young, and her mom remarried and has a new family in another village. She visits his mom during summer and winter breaks. Her mom and step father treat her well during her visit and usually give her about 50-100 yuans on her way back. She gets along with her younger half brother during her visit. She likes Chinese and English, and feels that the middle school has too many classes. She is about average in school. She is quite shy and quiet. She stays in school during the weekdays, which costs about 50 yuans a week at minimal (food). The boarding itself is free to her. If you read Chinese, and would like a more interesting reading about this visit, please go to Mr. Hu Jining's writing at Zhong Mei Ai Xin.